Honor Roll Member – Berger, Dr. Lisa Ellen « Perry High School Alumni Association, Inc.
Lisa was born in Perry, Oklahoma to Fred and Nellie Berger. At the age of 18, she enlisted in the United States Air Force serving during the first Persian Gulf War. After four years of service, Lisa enrolled at the University of Nebraska Medical School and completed her residency at the University of Oklahoma Health Sciences Center. After graduation in 2000, Lisa began work in Choctaw, OK as part of the St. Anthony Physicians Group. She was a board certified physician in family medicine, focusing on a full spectrum of medical care for children and adults. Lisa loved being a doctor and the patients she served. 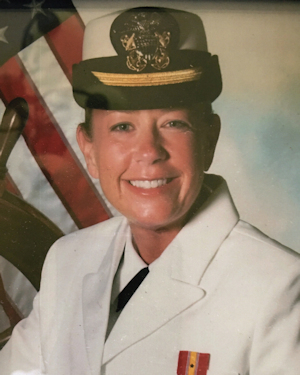 In 2009, she wanted to see the world, and joined the Navy as a Lieutenant Commander during the Afghanistan War. She served in Italy and then in Virginia where she met her future husband, Gary McClung. As an adrenalin junkie Lisa was known to zip line in the rain forest, jump out of planes over volcanoes, white water raft down the Colorado River, and shoot guns and bow and arrows. In her quieter times she vacationed in St. John and listened to country music. Lisa lost her life in an automobile accident in April, 2016. She is survived by her husband of three years, Gary; their two fur babies, Chesney and Miranda; her parents, two brothers and their families.